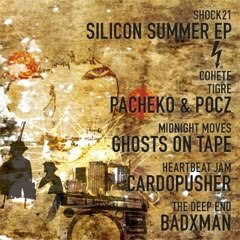 Shockout has released another pumping, bass, drummy, beat heavy EP - Silicon Summer. Barcelona's wizz-kid Cardopusher (and definitely one of my favorite dubstep / lazer bass producers) offers great, Night Slugz'-like beat and synth-driven dubstep summer vibes in Heartbeat Jam, but my favorite tracks come from Cardo's friends, the Caracas production Duo of Pacheko & Pocz. Kuduro step par excellence! Cohete with neon synths, stomping kuduro beat and talking bassline creates the fusion of sounds I would really like to hear more coming from dubstep / UK Funky / future garage scene!! San Fran's Ghosts on Tape mutates the sound and vocals in a kind of liquid digital raeggaton / UK Funky style but focusing more on darker and deeper vibes. Finally, BADXMAN from Agoraphobistan in UK employs tons of lazers in a dirty, rude UK urban trip rolling on a pulsating low-frequency sub-bass. This EP is a must for any fan of forward-looking EDM! !